Eschaton was a band I first encountered as I was researching material for that massive Greek black metal study of 2011, and while I wasn't impressed with either of the releases I heard, they were certainly not without some potential in scripting a balance of speed, melody, and visceral proficiency for the genre. It's now been 5 years since the ...for the New Aeon EP, and there have been some rather major changes to the structure of the project. Drummer K.Iakchos is the sole remaining member, and he's joined here by Orth (Primeval Mass, Stutthof) who takes on a load of duties here: guitar, bass, and vocals. Interestingly, I feel like this lineup shift has proven quite beneficial. While Unshaken is not a tall stride beyond its predecessors in terms of quality, I found the composition stronger and the atmosphere a fraction moodier and more resonant. This is not exactly a pure Hellenic style of black metal, with those slower, gracious overtures and gleaming, melodic majesties you'd expect of Rotting Christ/Varathron, or the diabolic experimentation present in so many of Necromantia's releases. No, you've got a more distinctly Scandinavian undercurrent here which draws upon the 'Golden Age' of the 90s releases. 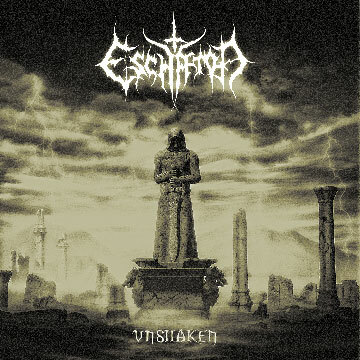 Unshaken is redolent of the older works of bands like Old Man's Child, Ulver, Borknagar, Dissection, and others who were expanding beyond the roughly defined borders of cruder newsprint black metal. They get a nice, understated buzz on the thinner guitars here which is perfect for delivering the desperate, melodic currents, and there's an airy, frivolous feel to the note patterns which makes you feel as if they're rushing past you on an Elysian field, or up a mountainside. Once in a while they'll break down into some more mid-paced grandeur, and in these instances they bring up more of the requisite Rotting Christ aesthetic, but the combination of livid snarls, crisper guitar tone and the occasional incorporation of acoustic accompaniment definitely casts a Northern European shadow, which in this case is not at all unwelcome. Moreso than on Causa Fortior, Eschaton paces itself out to provide a panorama of valleys and heights, and though they've kept some of the longer song structures intact (closer "Victa Iacet Virtus" eclipses the 9 minute mark), I felt that these were more appreciably diverse and well written. That's not to say there are points across this album which elude boredom entirely, because in the end Unshaken is simply nothing new under the sun, but to neglect the album's maturity over its elder siblings would be foolish. The drums have just enough tinniness to them that they mesh well with the brighter guitar progressions, and there are some epic sequences here where they'll churn out some bombastic, Bathory groove and layer on some bleeding harmonies that make you want to call to arms and crush someone. Bass is really lacking, though, almost to the point where its a nonentity, and while the vocals are crude and grimy, they're not so standout either. 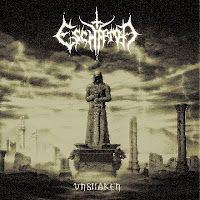 Ultimately, though, Unshaken is a solid listen, and purists of the form who desire more of a glorious palette of riffs than simply the raucous primacy of the genre's roots will find this a pleasant, flashing blade among the darkness.